39. Measured vs. Indicated Resources – Do We Treat Them the Same? - KJ Kuchling Consulting Ltd.
One of the first things we normally look at when examining a resource estimate is how much of the resource is classified as Measured or Indicated (“M+I”) compared to the Inferred tonnage. It is important to understand the uncertainty in the estimate and how much the Inferred proportion contributes. Having said that, I think we tend to focus less on the split between the Measured and Indicated tonnages. 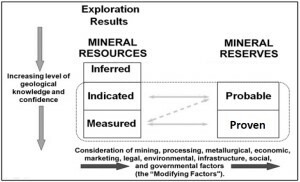 We are all aware of the regulatory limitations imposed by Inferred resources in mining studies. They are speculative in nature and hence cannot be used in the economic models for pre-feasibility and feasibility studies. However Inferred resource can be used for production planing in a Preliminary Economic Assessment (“PEA”). Inferred resources are so speculative that one cannot legally add them to the Measure and Indicated tonnages in a resource statement (although that is what everyone does). I don’t really understand the concern with a mineral resource statement if it includes a row that adds M+I tonnage with Inferred tonnes, as long as everything is transparent. When a PEA mining schedule is developed, the three resource classifications can be combined into a single tonnage value. However in the resource statement the M+I+I cannot be totaled. A bit contradictory. It appears to me that companies are more interested in what resource tonnage meets the M+I threshold but are not as concerned about the tonnage split between Measured and Indicated. It seems that M+I are largely being viewed the same. Since both Measured and Indicated resources can be used in a feasibility economic analysis, does it matter if the tonnage is 100% Measured (Proven) or 100% Indicated (Probable)? The NI 43-101 and CIM guidelines provide definitions for Measured and Indicated resources but do not specify any different treatment like they do for the Inferred resources. 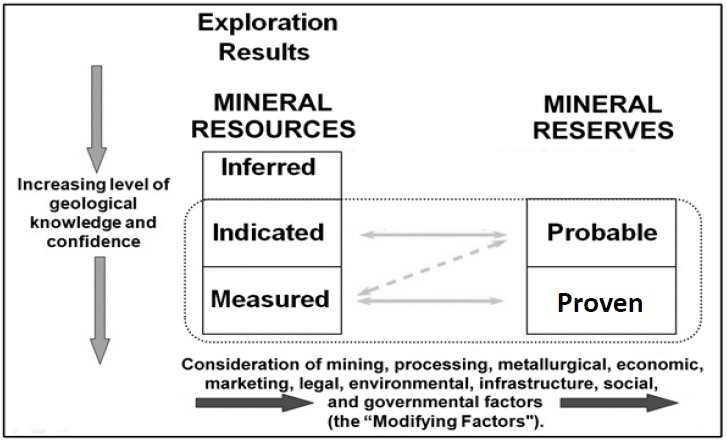 Relationship between Mineral Reserves and Mineral Resources (CIM Definition Standards). In my past experience with feasibility studies, some people applied a rule-of-thumb that the majority of the tonnage mined during the payback period must consist of Measure resource (i.e. Proven reserve). The goal was to reduce project risk by ensuring the production tonnage providing the capital recovery is based on the resource with the highest certainty. Generally I do not see this requirement used often, although I am not aware of what everyone is doing in every study. I realize there is a cost, and possibly a significant cost, to convert Indicated resource to Measured so there may be some hesitation in this approach. Hence it seems to be simpler for everyone to view the Measured and Indicated tonnages the same way. NI 43-101 specifies how the Inferred resource can and cannot be utilized. Is it a matter of time before the regulators start specifying how Measured and Indicated resources must be used? There is some potential merit to this idea, however adding more regulation (and cost) to an already burdened industry would not be helpful. Perhaps in the interest of transparency, feasibility studies should add two new rows to the bottom of the production schedule. These rows would show how the annual processing tonnages are split between Proven and Probable reserves. This enables one to can get a sense of the resource risk in the early years of the project. Given the mining software available today, it isn’t hard to provide this additional detail. Posted in: Mine Economics, Mine Modelling, Mine Studies. Tagged: 43-101, Feasibility Study, Mine Engineering, PEA, Study Management. ‹ 38. Claim Fees Paid for a Royalty Interest – Good Deal or Not? In my opinion the single most important economic variable in a study is how the block model was constructed. More projects are undone by a bad model than by any other factor. (Check out Rubicon for a recent example.) Therefore, it is critical for an investor to understand how the model was constructed…among other things. Another factor most people tend to overlook is that models are not deterministic. They are statistical risk based estimates and are merely blurry reflections of the originator’s knowledge and experience with resource estimation. So it’s good to know who did the model and what his background is. In the end, the model is simply a model of reality that can be very good or very bad. The designations of MI&I are only one component to the model that an investor has to consider before putting his money down. By coincidence, I putting together some thoughts for a future blog on the reliability of the QP’s doing the estimates. Unfortunately most investors cannot build their own block model so they have to rely on those QP’s doing the work. Further, investors can not verify the competency of the QP so there is a lot of trust in the system. I think you misunderstood. You don’t need to build a block model to understand how it was done, although it’s a nice and necessary check for doing due diligence. block size vs shovel size. normal or log normal distribution? cumulative probability curve and use of MIK. These are all things that a resource geologist can play with to enhance his interpretation of tonnes and grade. After reviewing a few reports a reader gets a good sense of which ones are well done and which ones are not well done. Over time you see the same names coming up on different reports, particularly among the juniors. When I see certain names I read a little more carefully. A frustrating aspect of technical reports is when an operation does one for their producing mine. These generally have less information than independent reports, particularly in the schedule, cost and economic valuation sections. I was looking at it from the viewpoint of retail penny stock investor that doesn’t have a mining background. The 43-101 report is pretty meaningless to them and also are the names of the QP’s. Maybe these type of people shouldn’t be investing in the pennies if they aren’t technically savvy and they cannot trust the system. Newsletter writers can fill the information gap, but then some of them are not entirely independent either. Penny stock investors are probably better off relying on hot tips on bullboards! Back to your original point on M vs I, it really does make a difference to someone like me because I think about what it means in a number of ways. Of course the risk factor will be higher if there is very little M and lots of I. Then there is the grade factor. Have you ever noticed how for most reports the grade is higher for M, lower for I and lower again for the other I? This is not always the case, but it makes me wonder if grade can be improved by more drilling to move I into the M category. Also, in those cases where the grade of I is higher than M it makes me wonder how well the resource calculation was done. I have heard this said before – “drill more holes to boost the grade”. Unfortunately tt doesnt work like that. It’s usually because the higher grade min, being the most attractive stuff, was where the greatest attention was paid, so more holes are drilled there to prove it up. The extra holes leads to the M classification. Cause is the greater density of data, effect is the M classification.